Organic Spa Houston is excited to offer the very latest in anti-aging and skin rejuvenation treatments: microneedling. From skin hydration to increased skin tone to younger looking skin, to softening scarring from acne or surgical scars, to minimize the appearance of stretch marks, to stimulating hair to regrow or grow thicker hair in a bald area, Microneedling can help reach your skincare goals. Transform and rejuvenate your skin with professional Microneedling treatments from the experts at Organic Spa Houston! What is microneedling & how does Microneedling work? Microneedling, also known as collagen induction therapy, is an advanced anti-aging treatment. It is a minimally-invasive, non-surgical and non ablative facial rejuvenation procedures that involves punctures the skin’s surface that inflict tiny holes in the skin with fine needle. This is typically done by a Microneedling device causes controlled micro-injuries to the skin, it creates a channel or micro-wound stimulating the body’s natural healing process to increase skin cellular turnover leading to the remodeling of collagen and elastin in the papillary dermis layer. This action leads to reduction of scars and skin rejuvenation, i.e., re-texturing the skin, increase the skin firmness and increase hydration. The microneedles penetrate the skin to the depth of 0.2 – 2.5 mm. Depending on the size of the treatment area the procedure is considered to be painless with application of numbing cream prior to treatment. Compare to other skin ablative skin treatments Microneedling reduces the risk of excessive skin peeling, hyperpigmentation and scarring therefore, safe on all skin complexion and even suitable for thin, hyper-reactive and sensitive skin conditions by strengthening the facial capillaries. During your treatment, the microneedling cocktails will be applied to your skin based on your skin conditions, which will absorb it. Each customize treatment uses a single, sealed, disposable, sterilized spring-loaded cartridge with ultra fine needles that works on different speed and depth ensuring a tailored treatment every time. During the treatment, you’ll experience a prickly sensation but no pain sensation. After your treatment, you will be given an Ultimate Skin Cocktail, otherwise known as your aftercare product, with detailed instructions to take home for home-care. Keeping up with proper aftercare routine is very essential after a microneedling treatment, as it will help to nourish your skin during the regeneration process. Microneedling treatment offers many benefits to our clients and a great alternative to lasers and more ablative skin procedures. This is a superstar treatment for all over skin rejuvenation. It works to minimize fine lines & wrinkles, acne & acne scars, enlarged pores, redness & rosacea and hyperpigmentation prone skin conditions! This treatment causes micro "injuries" to the skin which triggers new collagen synthesis, healthy growth factors are pushed on and into the skin to promote healthy skin cells to repair & rebuild. With proper Microneedling treatments from Organic Spa Houston, you can expect results including increased skin hydration, increased in collagen production, increased skin tone and smoothness, younger looking skin, softer acne scars and faster wound healing, improved wrinkles and fine lines, minimized large pores, reduction in stretch marks, skin tightening, lifting and rejuvenation. Clients tout the incredible results similar to fractional skin laser treatments, but without the uncomfortable side effects and lengthy downtime! -What is the difference between the derma roller vs the micro-needling device? A motorized microneedling device is a medical grade oscillates a plate of many micro-needles cartridge in a straight up-and-down motion on the surface of the skin. A derma-roller has many sizes & more tiny needles on a cylinder roller which moves in a revolving motion. Roller needles puncture the skin at an angle, as opposed to straight with a microneedling device. The Micro-needling device uses a precisely-controlled stamping method to reach a set depth while minimizing excess damage to the epidermis. It is also more sterilize, safer and more effective than traditional derma rolling because of the unique vertical needling technology. These channels are ideally clean, precise punctures in the skin that allow for maximum solutions and medications to penetrate for optimized results and healing. Angled punctures from rollers can actually create tears in the skin and may cause more damage than benefit. WHAT RESULTS CAN I EXPECT FROM MICRONEEDLING? After your microneedling appointment at Organic Spa Houston, you can expect results in just 24 hours and the results can last for months! What makes skin needling a safe and effective treatment is that it does not use any heat like lasers, nor does it remove the top layer of skin like chemical peels. After the microneedling treatment, your skin will appear flushed like sunburned, which will subside over the next 4-48 hours depending on the depth of needles cartridge used to treat a specific skin conditions and light tinted moisturizer can be apply the next day. The recovery is mild and light skin sloughing is expected depending on the depth of the treatment. Microneedling keep the skin’s barrier intact, do not burn like traditional chemical peels, does not damage the skin but rather heals it from the inside-out which leads to softer, smoother, thicker, healthier skin. How Often do i need to have microneedling? Consistency is key! Professional grade micro-needling results are similar to other skin laser treatment such as Fraxel but without the expensive cost, lengthy downtime and risks. Depending on the client’s skincare concerns series of Microneedling treatments are recommended. The number of sessions are determined by your skin types and conditions repeating every 2-4 weeks. The more sessions preform overtime, the more collagen and elastin your skin builds resulting in more even texture, healthier, glowing skin. The needle cartridge depth, number of skin passes, cocktail serums used and combination techniques differ for each client’s skin conditions. We understand the distress and emotional toll acne cause on your skin and self confidence due to years of constant picking at the acne causing acne scars. This treatment proven to fade scars in many ways such as increases collagen stimulation to produce healthy blood flow & increase skin cell turn over rate, combat stubborn acne by leveling out the skin by producing healthy collagen which in turn helps fight inflammation that causes acne, eliminates post inflammatory dark spots and can help remove Melasma. This immensely improves the majority of the scar marks, skin texture, firmness and hydration. Depending on severity/type of scars typically 3-8 treatments are required to see optimal results. This facial is for ultra hydration, skin tightening, lifting, and rejuvenation, improved wrinkles and fine lines. A great solution for treating skin areas with age spots and sun spot which are the result of sunlight exposure, as well as those that may occur after inflammatory processes on the skin (acne and pimples). Recommended for: intended for people with aged and dry facial skin with visible signs of skin ageing. It contains an efficient combination of hyaluronic acid and natural components which stimulates skin regeneration and protects it from external negative effects. It removes the signs of fatigue and ageing, restores surface layer of the skin and acts against wrinkles. A great solution to acne scarring. 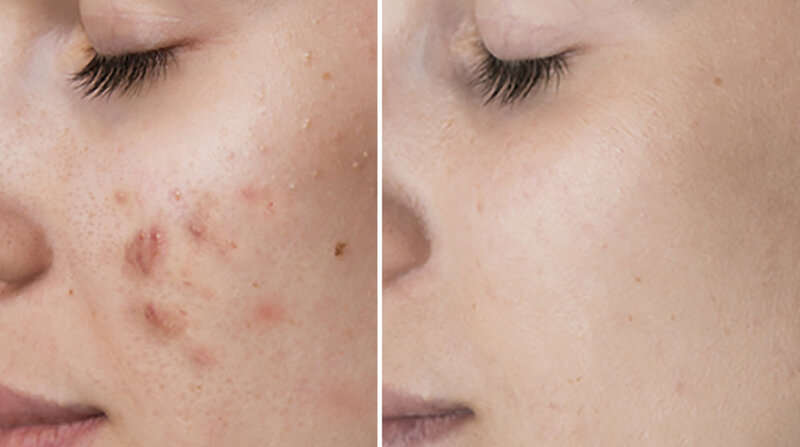 Microneedling effectively treat problematic acneic skin, prevent future breakouts, and help reduce the appearance of textural scarring from acne. This short procedure has very minimal pain and shorter peeling downtime than abrasive lasers or harsh chemical peels. Healthy and clear skin is achievable with microneedling. Treat sun damage spots, pregnancy melasma, stubborn dark spots and brightening the overall face complexion. Recommended for: intended for people with young and sensitive facial skin. Treatment contains an effective combination of hyaluronic acid and natural components which stimulates skin regeneration, soothes and softens the skin. Rejuvenate older skin and visible signs of ageing spots. This treatment contains an effective combination of hyaluronic acid and natural components which restores the surface layer, alleviates skin changes caused by ageing, sun rays exposure, etc. Recommended for: intended for mature and dry skin. It deeply nourishes the skin and increases its strength, elasticity and resistance. It represents intense care with visible effects of reducing wrinkles and age spots. Stimulate new collagen & enhance thin lips for a fuller pout. No fillers necessary. Intended for skin areas affected by stretch marks and scars. Formulation with high content of hyaluronic acid and complex active components with activity aimed at stretch marks is highly efficient in the fight against these skin changes. Choose from Stomach, Thighs, Arms, Back or Glutes area for tightening sagging skin. Reduce the appearance and flatten out post - surgical scars such as tummy tuck scar line, C-section scars, sport surgical scars, ect. Restore hair loss or thinning hair with microneedling treatment contains an effective combination of hyaluronic acid to nourish the scalp and natural components that prevent hair loss and stimulate the growth of new hair.